Do you love to ride roller coasters? Thought about going zip-lining, bungee jumping or even sky diving? If so, then a high performance driving school might be right up your alley. I wasn’t always an adrenaline junkie, but as I’ve gotten older, I feel like I’ve become more adventurous and more open to trying new things. Driving schools aren’t just for the guys to come out and play anymore. Some reasons for attending are more practical in nature, others are just fun. My indoctrination into the world of high performance driving came via another BMW CCA member. Then, my family started going to driving schools at Heartland Park Topeka. For my 18th birthday, I got to go to my very first driving school at Heartland Park, sharing the green 1999 M coupe with my dad. Not your typical daddy-daughter bonding time, but it works for us. Since that very first extremely hot weekend in Topeka, Kansas, I’ve done nearly 20 driving schools at tracks all over the country, including Mid America Motorplex (MAM), Heartland Park Topeka, Road America, MidOhio Sports Car Course, and Barber Motorsports Park. Schmitz, of Nurburgring Ring Taxi fame. She’s done over 20,000 laps of the 20.8km Nurburgring, and has also appeared on UK’s “Top Gear” several times. There aren’t too many other women role models in high performance driving except for Danica Patrick and a few others, but I feel Sabine is much more humble and more versatile driver and thus a better role model. As time has gone on, we’ve had a few women come out to try a driving school, but not too many stick around for the 2nd year and after that. Here are a couple of good reasons to come out and try it: First of all, it’s fun to “beat” the boys. I’ve had a couple instructors tell me that women are easier to teach than the men, so perhaps we also learn quicker and pick up new skills quicker. You don’t have to be the fastest car in a straight line to pass people on a road course. Half the battle is finding the best way through a corner to maximize your exit speed. Second, and this should appeal to the shopaholics out there… you can buy some really cute driving shoes! We always recommend to drivers that you wear shoes that are obviously closed-toe, but also something with a smoother sole that won’t get mixed up in the pedals or possibly get caught. I’m a big fan of Puma’s Ferarri Collection; specifically the Drift Cat style, but they now have a BMW Motorsport Collection with all kinds of shoes appropriate for the task. Piloti also makes some great driving shoes, as well as Adidas, Simpson, and Oakley. If you get really into driving, then you can buy a really cute helmet; mine has flowers and kind of a tribal pattern on it. throttle and braking inputs. Some people say that “smooth is fast” and that holds true in both the wet and dry situations. Jerking the car around won’t help at all. So, have I convinced you yet? Think that you’d like to try a driving school? One of the best places to start is at the Iowa Chapter’s Longest Day Driving School at Mid America Motorplex June 7-9. 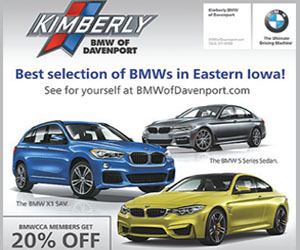 Check out www.bmwia.org for more information and registration links. Hope to see you there… and wear some cute shoes!